The Extreme Life of the Sea by father-son team Stephen R Palumbi (marine biologist) and Anthony R Palumbi (science writer & novelist) was, to me, like a grown-up version of some of my favorite childhood books – books of interesting animal facts, like how high a mountain lion can jump or how fast a house fly can fly. The Extreme Life of the Sea is less narrative and more an enthusiastic sharing of cool things in the sea, which are loosely tied together in thematic sections. It is not, however, just a collection of “gee whiz” facts. The compelling vignettes help to convey broader concepts of science and nature with excitement and enthusiasm. Most of all, the Palumbis remind the reader that science and nature are not just important, they are fun. The Palumbis’ writing tries to capture the excitement, drama, and intensity of life in the ocean. Although the effort is at times more labored and at times more effortlessly, the book is difficult to put down. The compulsion to find out “what’s next” is nearly irresistible. The compulsion to share the interestingness of sea life is nearly as irresistible. At the end of March, we hosted a dinner party at which I had to physically restrain myself from excitedly discussing fluid drag and why dolphins jump out of the water so much. And bioluminescence. And squid jets. And… I’m fun at parties. While The Extreme Life of the Sea targets an adult audience, the inspiration to share knowledge can be harvested to pass on that enthusiasm to children. My daughters have gone down the rabbit hole of marine investigation based on my sharing of an exciting story from The Extreme Life of the Sea fleshed out with the “just the facts ma’am” approach of the National Audubon Society Guide to Marine Mammals of the World and the stunning visuals of Blue Planet. Let’s just say that blue whales are really big (metaphorically) in our house right now. We often think of science literacy in terms of concepts and “facts”. The Extreme Life of the Sea makes an important contribution beyond the concepts and information presented – enthusiasm. It reminds us that science and the natural world are REALLY COOL. 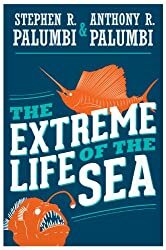 Going to the beach, getting on a boat, or taking your ridiculous primate body for a swim is going to be a lot more fun after reading The Extreme Life of the Sea. This entry was posted in Curiosities of Nature and tagged anthony palumbi, Book Review, Books, marine biology, Princeton University Press, stephen palumbi, the extreme life of the sea. Bookmark the permalink. In which Items of Interest and Curiosities of Nature are discussed employing the latest techniques in Logic and The Scientific Method for the furtherance of Human Erudition and the promotion of Critical Thought. The individual writers at The Finch & Pea retain full copyright over their original content. The text of posts appearing here, unless otherwise indicated, is distributed under a Creative Commons Attribution-NonCommercial-ShareAlike 4.0 International License. All images are the property of their respective owners with all rights reserved unless clearly indicated otherwise. All other materials ©2015 - The Finch & Pea Group, Ltd. All rights reserved. If you have questions, comments, or believe content on this site is being used in a manner that is inconsistent with the wishes of the content creator, please contact The Finch & Pea staff at finchandpea@gmail.com. In the interest of maintaining our respectful community, we reserve the right to moderate, delete, or ban any individual comment or user at any time and for any reason without prior notice on a case by case basis. While the First Amendment of the United States Constitution states "Congress shall make no law...abridging the freedom of speech...", we are not Congress.